A chinito charmer from Caloocan got three chairs turned with her rendition of “I’ll Be There”. 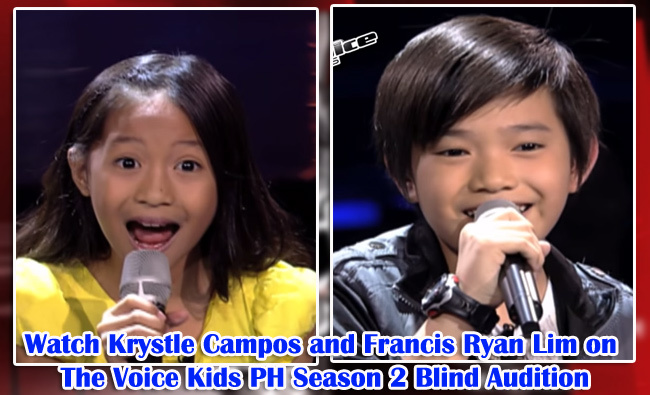 Twelve-year old Francis Ryan Lim started singing at the very young age. He was nine years old when he started guesting in different events. He dreams of being a good singer and be known for his talent. “Unang bukas pa lng ng bibig mo alam ko ng magaling na magaling tong batang to!” Coach Sarah exclaimed. “Nahuli mo na ako sa umpisa mo pa lang.” , commented Coach Bamboo. “Iba boses mo!” he added. Lea is also amazed by Francis’ voice. “Saan nanggaling ‘tong boses na ‘to!”, she mentioned. In the end, Francis chose the Coach whom he idolizes since he was three years old, the pop princess Sarah Geronimo. Another three-chair turner from Calamba, Laguna landed on Team Sarah in “The Voice Kids Philippines”. Krystle Campos, twelve-year old is the eldest among the four children in their family. Her family owns a farm in Calamba, Laguna and she is taking care of her pigs. The judges wowed with her rendition of “Nais Ko”. The two female coaches turned their chairs simultaneously. “Sobra ako na- amaze! Ang ganda ng boses mo, and ganda ng pagkakanta mo, para kang nagkwekwento.” said Coach Sarah Geronimo. Lea Salonga even showed her a huge passport and told her that she will help her travel around different countries with her singing talent. Meanwhile, Bamboo praised her style of singing. “Maganda and pagkakanta mo!”, he added. In the end, she chose the coach that she idolizes not just in singing but also in acting, the pop star princess Sarah Geronimo.